The Spanish firm celebrates the 10th anniversary of the first Shop & Roll basket that revolutionized the world’s shopping system with its wheels and telescopic handle. Since then more than five million baskets have been sold in 30 countries worldwide. Greater capacity, robustness and a design that incorporates improved product hygiene are just some of the features of this new one-piece 65 l Shop&Roll basket that Araven has just launched on the market - a new product that completes the Aragonese firm’s range of baskets created to facilitate and enhance the point of sale shopping experience. The launch of this new product coincides with the tenth anniversary of the first Shop & Roll which revolutionized shopping systems by adding two wheels and a telescopic handle to traditional baskets. 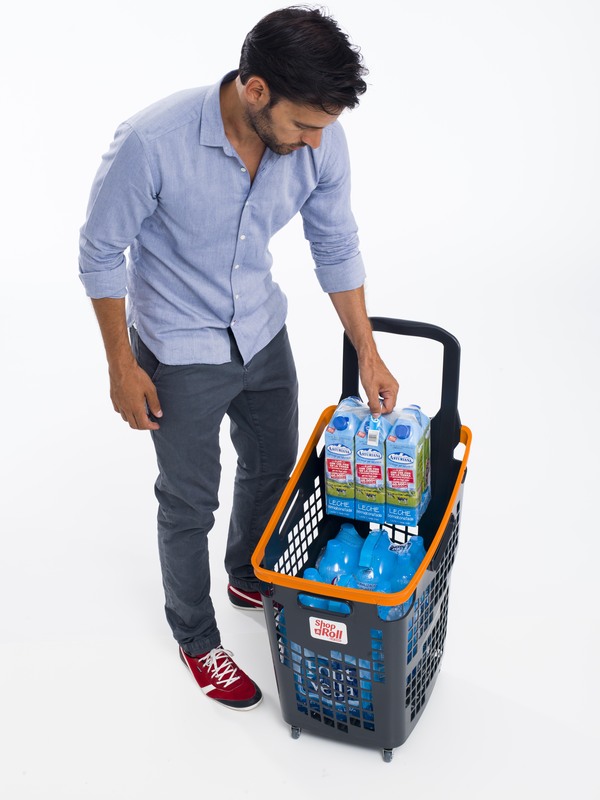 This shopping basket has evolved over the years to allow increased mobility with the incorporation of four wheels and a capacity of up to 52 litres. Over the past decade more than five million baskets have been sold in 30 countries worldwide. Araven has now gone a step further in launching its new 65-litre one-piece basket that includes a most noteworthy innovation: it is the only two-colour plastic shopping basket on the market made in one single piece. The manufacturing process incorporates of bi-injection technology, reducing the risk of breakages that can occur when parts have to be joined together. The basket is easy to use with one or two hands and can be pushed along effortlessly like a cart (thanks to its 4 wheels, 2 of which are fixed and 2 360º swivel) or it can be moved alongside shoppers, accompanying them at all times. It is light and ergonomic and requires no mechanisms or movements to use it or stow it away. The handle runs all the way down to the open mesh bottom of the basket, which affords it great sturdiness. The features of this new basket recall Araven’s latest great innovation: the Shop & Roll 100-litre Loop cart which has been on the market for a year. What is more, the new one-piece basket has the same aesthetically attractive perimeter handle of the Loop, which helps create a uniform image at the point of sale. Just like the shopping cart and the other Shop & Roll baskets, it can be supplied with customized colours and the flagship logo, which also helps to align the global image of the establishment. Thanks to its capacity and adaptability it is a multi-shop element, able to adapt to different shop formats. Today consumers increasingly do their shopping at their local store and precisely this type of establishment needs a shopping element that takes up less space and is manoeuvrable. It is often not easy to change direction or turn in narrow aisles and for this reason new solutions have to be found to take best advantage of available in-store space. Another advantage of this new product is its large capacity which means that it can hold bulky packs frequently found in different sectors (food, DIY, toys).